It’s strange to be writing on such a seemingly obvious topic, but if you’ve clicked on a link to get to this article, then there’s a good chance you know why I’m writing it. When starting my design career, I was always told to never hesitate to ask for help when I needed it. While this is no myth, I found the advice wasn’t so easy to follow. As I moved to the hiring side, I’ve been in many conversations with senior leaders saying things like, “we need people who will ask for help when they need it.” As a leader, I’ve caught myself getting frustrated when a junior designer doesn’t reach out to me when I can tell they are clearly struggling. So then what’s going on here? Asking for help is like asking for directions, it only occurs to you when you actually know you’re lost. Asking for help requires that you know you need help. And that requires that you generally have an idea what you are trying to do in the first place. Design is a murky field. Between the ever-evolving technology landscape, or the endless debate about tools and methodologies, understanding what you’re doing isn’t crystal clear. Not asking for help can be a sign of arrogance (more on that later), but it can also simply be a sign that someone is lost and doesn’t know it. Or that someone is working towards the wrong goal. Or that someone simply doesn’t know how to ask — like being lost in a foreign country and not being able to speak the native language. Asking for help isn’t so easy, but I’m going to break down why it happens and how designers can break themselves out of bad habits so that they ask better questions; better questions that will lead to better solutions. And for those of you concerned about your career, becoming great at asking for help is one of the most underrated skills in the industry. Every designer starts this way. I still find myself spending too much time working through a problem, when simply asking someone would save me hours of consternation. For such a collaborative field like design, it’s odd how much designers really stay inside their heads. This is one of the most common anxieties I hear from designers starting new jobs. I totally understand it…but it’s totally wrong. I’ve never heard of someone getting fired for asking too many questions. However, I have heard of people losing jobs over missing deadlines, or doing lackluster work. Not convinced? Asking good questions doesn’t show incompetence, asking no questions does. If the first challenge is typical of beginning designers, and the second is common amongst junior designers, then this one is reserved for the seasoned, principal designers out there — the old dogs who can’t be taught new tricks. This is where experience can dangerously lead to arrogance. All the horror stories you hear from other fields where doctors didn’t ask the right questions, or engineers didn’t scrutinize building plans stems from this problem. The need for help doesn’t disappear with experience, just the desire to ask. You don’t have to present for critique, necessarily. But getting your design ready to present to your team will force you to step away from your design and figure out how to communicate it to others. This act will start to expose areas you don’t know very well. Once you present your design, you’ll get questions you inevitably don’t have answers for — those questions are surefire signs of areas that need improvement. But the beauty of finding this out with your team is that you can ask for help right then and there. A simple reply like, “That’s a great question and I don’t have a great answer. Do you have any ideas or suggestions?” will work wonders. Often, the help you need to ask for may fall outside the realm of design. In this case, you can get indicators for where you need help by explaining your design to someone outside your design team — such as a PM, developer, or some other stakeholder with knowledge of the industry or product. They will be quick to point out gaps you had no idea you ever considered. When I was designing enterprise software, I found myself misinterpreting requirements because I didn’t understand the history of the product. As a result, I didn’t realize I needed any help. But once I presented to my PM, I quickly realized the gap in my knowledge and realized I needed to ask subject matter experts for help ensuring I had the right fields in my designs. What does this have to do with help? Often, designers who aren’t asking for help when they should be are doing it because they are inundated with work. And they’re usually inundated with work because of poor planning. In today’s agile world, this shouldn’t happen. Break your work down into smaller chunks, which gives you more opportunities to estimate accurately. Think of it like a road trip. I can give an estimate for how long it will take me to drive 5 miles within the minute. But for a 180-mile trip? I’m lucky if I can estimate within 30 minutes. What happens if I underestimate and commit to a time? I speed and act recklessly. Designers that don’t estimate will act recklessly — and that often results in not asking for help when it’s clearly needed. Design planning will require its own Netflix mini-series to explain how to do it well. But in the meantime, you can do yourself a favor by simply taking your initial estimate for what you can get done, and shave off about 15%. Or if you prefer, take the hours/points you estimate on your first pass and add about 20%. This will give you more room to screw up, and will reduce your panic-induced reaction to speed recklessly to make your deadline. You’ll have time to pull over and ask for directions. And that bruised ego you fear from asking for help will remain intact because you’re more likely to over-deliver than let your team down. Asking for help is hard because designers often get themselves into positions where they aren’t thinking clearly. As you start getting more experienced, not asking for help tricks us into thinking we look competent. But both of these situations can be avoided by acknowledging that a designer who asks for help is better than one who delivers late or sloppy work. Once you adopt this mindset, you will develop habits that consistently force you outside your work bubble to ensure that you get perspective on areas where you need help. When I’m not helping you help yourself, I’m working on Sketch design tools at UX Power Tools to make you a better, more efficient designer. 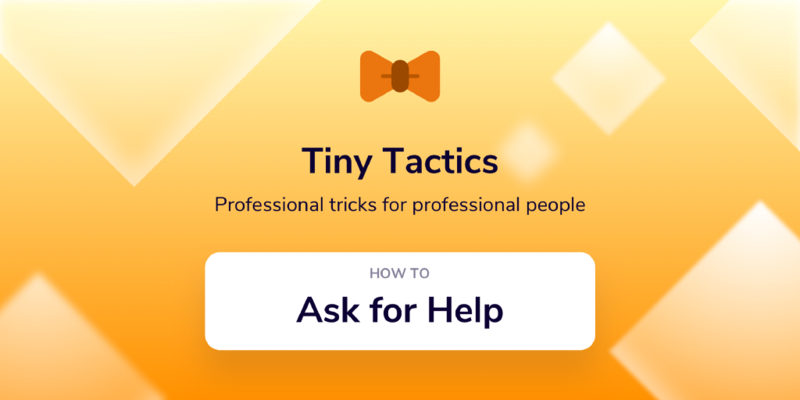 How to Ask for Help was originally published in UX Power Tools on Medium, where people are continuing the conversation by highlighting and responding to this story.